Founded in 1994 in Stockholm, Sweden, Wayne’s Coffee has been run and owned by the same founders for more than 20 years. But that is now changing. With the acquisition by Tank & Rast Entwicklungsgesellschaft mbH (TRE), a subsidiary of the German Tank & Rast Gruppe, Wayne's Coffee is expected to increase the pace of its rapid global expansion. Wayne’s Coffee is facing its first major change in ownership since the company’s first coffeeshop opened in central Stockholm, more than 20 years ago. Ever since then the company has been owned and actively managed by the same founders. During this time, Wayne’s Coffee has grown to include 125 coffee-shops in 7 countries, both in Europe and Asia. Today the acquisition by a new owner was announced. The new owner taking charge of the expansion is the company TRE, a subsidiary of the German business group Tank & Rast Gruppe. Like Wayne’s Coffee, the group is based on a franchise model. Among other businesses it is responsible for 410 service areas, including some 50 hotels within the German motorway network. Spreading the Swedish “FIKA” culture The change in ownership does not mean that Wayne’s Coffee is changing the business direction, which is underlined by Carlo Caldi, CEO at TRE. – We feel honored to take up the journey that the company started in 1994, to spread the “FIKA” culture across the globe. The partners are expected to increase the pace of the expansion in Sweden and internationally. Something that started in 1999 when Wayne’s Coffee crossed the border into Finland. Mats Hörnell, the future CEO at Wayne’s Coffee, comments on the new opportunities in Europe and globally. – TRE is securing our offensive expansion in the home market of Sweden, but also adds new opportunities abroad. We’re already growing rapidly in Europe, the Middle East and Southeast Asia. And now we’ll be able to increase the pace ever further, especially in Central Europe. Developing the Wayne’s culture The new partnership is about more than giving Wayne’s Coffee the muscles needed for economic growth. This is something that is pointed out by the retiring CEO Anders Stål, who is one of the original owners. – Basically, it’s about strengthening Wayne’s Coffee. Long-term stability and continuity are very important for the company. But it’s also of utmost importance to continue developing the Wayne’s culture, striving for perfection with the “Swedish Fika” concept. This is a common vision shared by the new partners and future CEO Mats Hörnell. 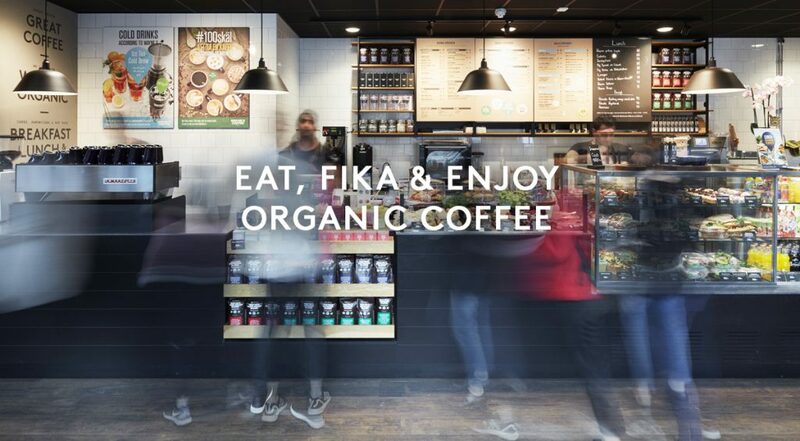 – In our new organization we will make sure that the brand and our strong concept will live on, grounded in our unique position as an organic chain of coffee-shops. We’re looking forward to the next step in Wayne’s Coffee’s continued development together with the new owners.